From left to right: Katy Holloway, Credit Controller, Akabo Media, Rob Mabey, Senior Technical Lead, FatFace, Steve Lovelock, Operations Manager, FatFace, Georgina Roach, Personal Assistant to Simon Ratcliffe, FatFace, Laurence Reed, Operations Manager, FatFace, Ricardo Guimaraes, Operations Manager, FatFace, Stephen Webb, Senior Operations Manager, FatFace, Simon Ratcliffe, Infrastructure Director, FatFace, Ola Mazurkiewicz, Operations Manager, FatFace, Joanne Wilson, Talent Management Lead, FatFace, Sarah Haswell, Supply Chain Analyst, FatFace, and host Sara Pascoe. This was a strong field – but there was a clear winner. FatFace has designed, fitted out, and is now operating a new purpose built multi-channel national distribution centre for its branded retail apparel business. The warehouse is regarded as a key strategic enabler of rapid business growth across multiple channels and a multiple service levels. The facility includes new inventory model that supports a multi-channel and international business, a new approach to crew working practices & channel flexibility to meet the volatile channel and seasonal demands, improved performance at key measures of throughput, speed, customer differentiation, and cost per unit reduction. 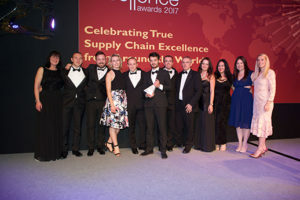 The judges were impressed by the impact of the new distribution centre, and the Award goes to FatFace.